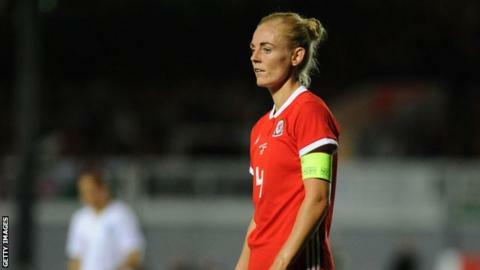 Wales manager Jayne Ludlow has paid tribute to the character of captain Sophie Ingle. Ingle, 27, helped Chelsea to the Champions League semi-finals with victory over Paris St-Germain Feminines while coping with her father's death. On the day of her father Stephen's funeral, she was named in the Wales squad to face the Czech Republic at Newport's Rodney Parade. "It's obviously going to impact our camp," said Ludlow. "We have a challenge ahead of us as a group to balance the sadness that one of our main players is going through right now and make sure we support her through that. "Then on the other hand we have a celebration to make sure we do Loren [Dykes, who will win her 100th cap] proud and make sure this event is an event that matches what this is for her. "I want the team to step on the pitch and play in a stable and in a manner that is going to be relevant to what she has achieved, so I want them to go out on there and compete and win the game for her." Ludlow is the only Welsh player to have won the Women's Champions League, having won what was then the UEFA Women's Cup with Arsenal in 2007. Now Ingle's club Chelsea face a semi-final with Olympique Lyonnaise, who include Wales' most capped player Jess Fishlock. "It's unfortunate they both can't be on the pitch in the final but one of them is definitely going to get there. Right now I am not sure who I would put the money on," said Ludlow. "Lyon have to be the favourites with the level of players they have there obviously with the history of picking up major trophies. But Chelsea are a very good team with a very good manager. "It's an exciting one. It's great to have two Welsh internationals competing at that level and hopefully in the future we will have more. "It's been a very difficult time for Sophie in particular over the last week. "So with that in mind you consider she stepped on a Champions League quarter-final pitch two times since this happened and from all accounts she has been one of the best players on the pitch. "I think that tells you about our national team captain."